Hallway inspiration. Image from Pinterest. I've been dreaming about decorating our hallway and staircases for what feels like an eternity. We last painted the hallway over seven years ago when we first moved in. At the time we were poor first time buyers, and we chose a cheap blue/grey satin finish emulsion to cover the walls which I've hated ever since. It was one of those quick, rash decisions of 'oh its plastered now, let's just paint it'. Well, Let me tell you, never make rash decisions when choosing paint or wallpaper. This stuff's up there for the next 7+ years, so you have to love it, and paint isn't cheap. 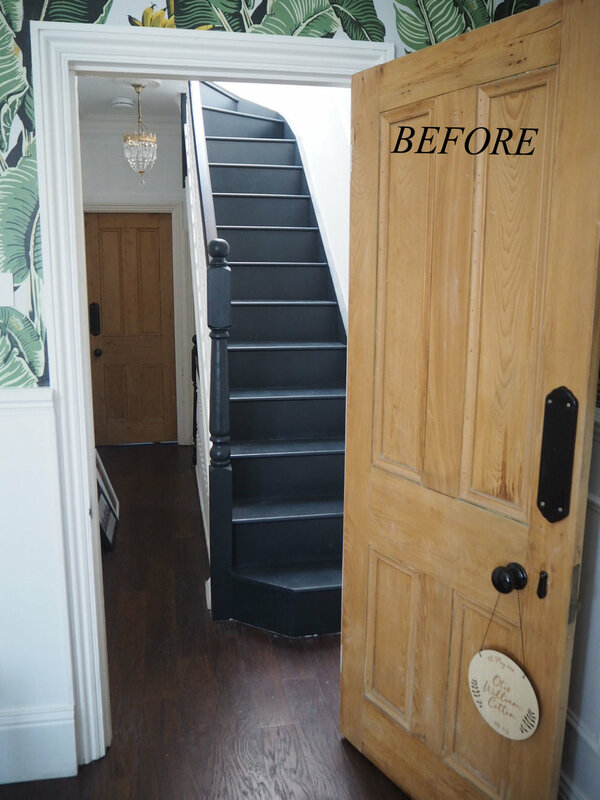 After our loft conversion in February, we've been left with a trail of black dust on the walls throughout the two staircases, all the way through to the front door, so its never looked worse than it does right now. Our hallway and stairs are narrow, and I mean super narrow. Its not even a meter wide, so its cosy and slightly claustrophobic, which makes it a bloody nightmare with the buggy and baby but thats a whole different story. *I think I screamed 'lets move house' in the first 4 weeks of Otis arriving, but I've calmed down now*. I've also come to realise that this tiny space, is actually the biggest room in the house per square meter, which in turn makes it one of the most expensive to decorate. It might be narrow, but it is long! And we have three floors to cover, which is why its been a long time coming. I want to add more character back into the space since its the first room you see when you enter the house, so its got to serve impact. I'm planning on using the deco martini wallpaper in blush from Divine savages to do this. I've teamed up with the boys from Divine Savages to showcase one of their signature prints, and it should add some opulence and drama back into this drab grey hallway. I'm planning on grounding the wallpaper against a dark bottom half, which will be painted in Farrow and ball Railings. I recently added a dado rail half way up in preparation for the renovation. We added the dado for two reasons. One, it will save money on the wallpaper, as we can only afford to paper the top half. And second, it should elongate the spaces. Who am I kidding, it's still going to be the same width and length but a girl can try right? Adding dado rail is an inexpensive way to add character back in to any room. We bought ours from Wickes for £4 per 2.5m, and then all you need is some no-nails glue, an angle cutter/saw, and maybe a handy dad like mine to do it for you. Cheers dad! The hardware will be a combination of black and brass. Black plugs and switches from Dowsing and reynolds, a brass mirror from Made.com, and we've ordered a new brass coat hook from westelm. I'm going to wait until its complete to decide on art/ photography as I want pieces which are monochrome and simple to not draw too much attention away from the paper. Founded in South East London in 2016 by husbands Jamie Watkins and Tom Kennedy. Through a shared passion for quirky interiors and styling they set out to do interiors their way and put their experience in fashion and design to create a new brand for the artistic shopper; a brand that mixes influences from classic prints, bold fashion and iconic modern design yet always with their signature Divine Savages twist. If you like dark, maximalist, vintage inspired interiors which are on the quirky side, then start following them on instagram as they are definitely ones to watch for the future. To see their full collection click here. And I'll be back on here in a few weeks to show you how it all went! To see the full moodboard and details of the hallway plans, scroll to the bottom of this page! A before shot of the first floor landing. The second set of stairs leading to the loft bedrooms. 1. Antique crystal chandelier, purchased from Ebay.